Gilt Groupe flash sales are the guilty pleasure of many a would-be fashionista. Each day, the site e-mails exclusive offers for luxury items at a fraction of the retail cost. Red Privet staffer, Lissa Richards, had ordered a few items from the site when what she thought was a perfunctory customer survey showed up in her inbox. Lissa completed the survey offering her honest opinions about her experiences with Gilt–both good and bad. She hit “Submit” assuming her answers became nothing more than rows stored in a marketing research database. 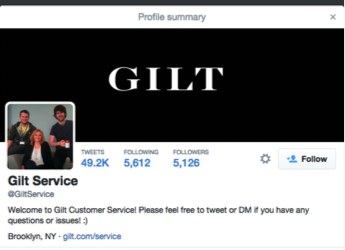 Within 10 minutes of taking the survey, Lissa was surprised to see a tweet from @GiltService show up on her timeline–acknowledging her feedback from the survey and telling her they were hard at work addressing her issue. Lissa was so impressed with the acknowledgement of her opinions that she immediately tweeted back her thanks and love for Gilt to all her social media followers. One of our deepest human needs is just to be noticed, listened to and validated. By simply treating another human like they were actually human, Gilt’s customer service team fulfilled a desire to create a Moment That Matters and gained a loyal customer.